As the November election approaches, Elk Grove voters will be receiving their share of mailers from candidates, political parties, initiative supporters and the so-called independent expenditure committees. For Elk Grove voters in this election cycle there is another source of glossy mailers - government entities. In recent weeks, Elk Grove residents received a mailer from the City of Elk Grove discussing quality of life issues and topics including the city's long-neglected road maintenance program. The subtext of the mailer though was to test the waters regarding a sales tax increase that the City Council will contemplate taking to voters. 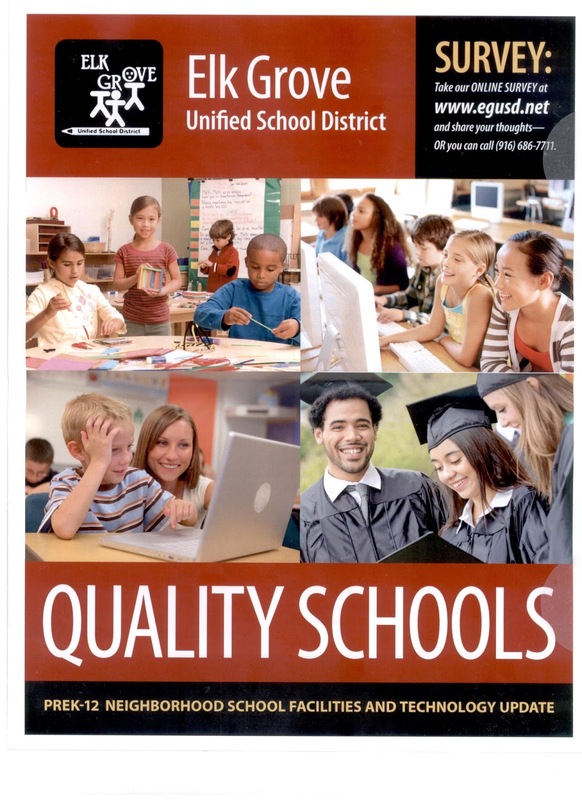 Today, voters in the Elk Grove Unified School District received a glossy, high-cost four-page mailer from the district urging respondents to take their survey. Like the City, the EGUSD is contemplating going to voters seeking additional funding through the issuance of bonds. 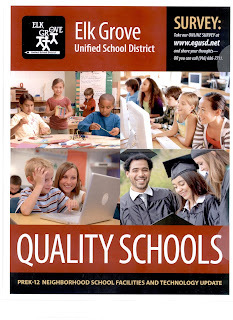 The EGUSD mailer explains the district's facility goals along with a letter from Superintendent Christopher Hoffman. In his letter Hoffman says "with limited help from the State, the burden is growing to adequately repair and upgrade our aging school facilities and classroom technology." And like the City, the school district has not yet decided if it will take the matter to voters. If they choose to pursue a facilities bond, it could reportedly cost up to $1.7 billion over the 30-year life of the bond. Of course, the City and the EGUSD are not operating in a vacuum. Along with their possible measures, Elk Grove voters may also be asked by the Sacramento Transportation Authority (STA) for a sales tax increase on top of the City's, and the State of California may seek voter approval of a $9 billion school bond. Faced with two possible sales tax increases and the expense of additional bonds, voters might well throw up their hands and vote no on all measures. The STA Board of Directors, Elk Grove City Council, and EGUSD Trustees would be well-advised to proceed cautiously.